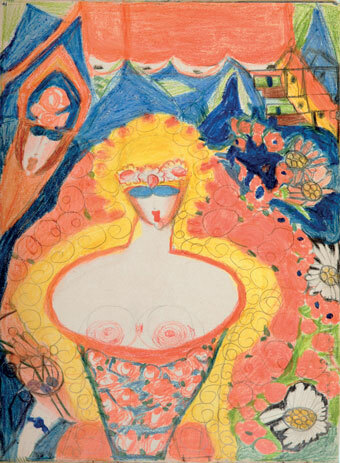 With 316 works by 93 women artists from 21 countries, Flying High will present for the first time a comprehensive survey on women artists of Art Brut, in all their diversity, their historical and contemporary dimensions, their international relevance. The term “Art Brut” – raw art or outsider art – has gained new dimensions in recent years and now goes beyond an exclusive focus on works from psychiatric institutions to include “mediumistic” artists (i.e., steered by a spirit), so-called “lone wolves”, and works by artists with disabilities. From 1860 until the present day, the exhibition will present highlights from the historic collections of psychiatrists Walter Morgenthaler and Hans Prinzhorn, a selection of masterpieces from the collection of artist Jean Dubuffet (who coined the term “Art Brut”), and from L’Aracine Collection. Major lenders: Stiftung Psychiatrie-Museum (Bern), Universitätsklinikum (Heidelberg), Collection de l’Art Brut (Lausanne), LaM (Villeneuve d'Ascq) as well as major international and Austrian private collectors.